The Indo-European indefinite/interrogative pronouns *k wi-/k wo- are the source of relative pronouns in several daughter languages, including varieties of Romance, Slavic, and Germanic among others. These pronouns did not head relative clauses in PIE, and so their presence in the relative clauses of the daughter languages is a result of processes of historical evolution which have recurred in different subfamilies. However, this recurring parallel process is by and large confined to Indo-European. Comrie (1998) claims instead that the interrogative relative pronoun strategy is a European areal phenomenon, because it is also found in neighbouring languages such as Hungarian and Georgian. However, there is ample evidence that endogenous innovation gives rise to interrogative relativizers in English and several other Indo-European languages. This suggests that such endogenous processes may be wholly or partly responsible for the emergence of interrogative relativizers across Indo-European. However, these processes are not the same across daughter languages: there appear to be several meandering paths from the same start point to similar endpoints. In this talk, we establish a framework for describing both the parallel diachronic pathways and the dimensions of variation around those pathways. The broad outline of the parallel developments can be established by combining a typological perspective on Indo-European indefinite/interrogatives with results from Haspelmath (1997) on the relationship between interrogative and indefinite pronouns, from Belyaev & Haug (2014) on the typology of correlatives and conditionals, and from Haudry (1973) on the relationship between correlatives and headed relatives. At the same time, the behaviour of individual lexical items within this typological space is less predictable, accounting for the variation around this broad pathway. This paper was read at the Annual General Meeting of the Philological Society in Oxford, Somerville College, on Saturday, 16 June, 4.15pm. An audio recording and screencast of the paper can be found below and on the Society’s YouTube channel. A PDF version of the presentations is also available. The present paper explores the synchronic distribution and historical development of an intensificatory construction that has so far received little attention in previous literature on English; i.e. what Huddleston and Pullum (2002) label as INTENSIFICATORY REPETITION (e.g. old old story, long long way). Synchronically, the paper records the existence of two functional subtypes of repetitive intensification (affection and degree) and expands previous accounts by showing the functional versatility of the degree intensificatory subtype. At the diachronic level, the paper dates the establishment of (degree) intensificatory repetition to the Late Modern English (LModE) period. It also suggests that (a) intensificatory affection was the first repetitive (sub)type to develop in the language, and (b) that its collocational expansion from Early Modern English (EModE) onwards may have paved the way for the establishment of its degree intensification counterpart. More generally, the paper shows that formulaic phraseology can contribute to the development of fully productive constructions and advocates the need for further study of ‘minor’ intensificatory constructions (such as the one explored here) and the way in which they may help to refine current standard descriptions of the English Noun Phrase. I am arranging a conference on the work of the Russian Linguist and philologist, Yuri Rozhdestvensky (1926-1999), Professor at Moscow State Lomonosov University. 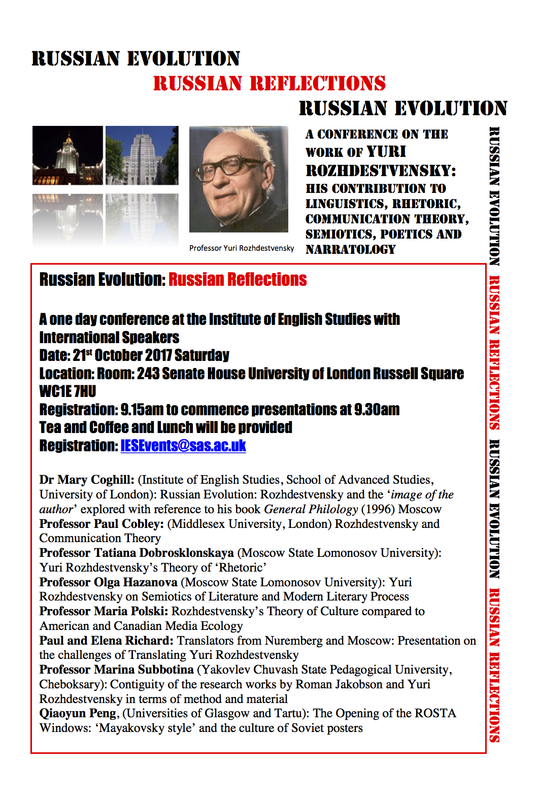 The conference is to be held at The Institute of English Studies, Senate House, University of London 21st October 2017. Further details and booking facilities are available on the conference website, and also on the poster. Are there any member(s) who are especially interested in Russian philologists/linguisticians, especially Viktor V. Vinogradov and/or Roman Jakobson? What is ‘diachronic philology’? Can it be defined as the study of philological development as a process to be studied in its own right? I think (cautiously) that this is how I would define it. I am not (so far) aware that it is defined at all. It seems to me, that there are those who are interested in languages other than their native one and are engaged in comparative philology; those who study how a particular language alters over time and are engaged in a historical study; but who studies philology itself as a theoretical process – not as a study of the individual components of philology, as for example the history of the book – but as a quest for a theory of the process of the development of culture? I would welcome any answers to the above and please do come to the conference; you can contact me at Mary.Coghill[at]sas.ac.uk .